In this site I intend to illustrate my ownership of an early Grey Ferguson Tractor. People buy tractors for all sorts of reasons mine was originally based on practicality. For 9 years now I have been living in rural Victoria. The move was motivated in part because my ex-wife is deeply into dressage...which means horse ownership...which means land ownership. I had been maintaining my property with nothing but a ride on mower. This seemed perfectly satisfactory until we built our arena (60m x 20m sandpit for all weather horse riding). Arena's need to be leveled constantly so they don't form tracks in well traveled areas. There was no way the ride on was going to deal with that! 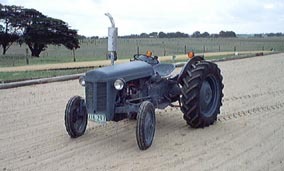 Therefore, the decision was made to buy a tractor and the cheapest tractor in Australia is the Grey Ferguson TEA20. That practical motivation has deformed into an irrational passion for all things Ferguson. Unfortunately I'm now moving off the land and back to suburbia so now I will be selling the Fergy and all the implements and bookettes on this site. Well here it is TEA 24114. An early 1948 model with a Howard reduction gearbox.